The type of computing system in which one powerful workstation serves the requests of other systems, is an example of client server technology. A computer network is an interconnection of computers which share various resources. A computer server is the powerful computer, or the set of computers connected to each other, which provide services to other systems. They usually have database integrated in them, and are very powerful machines with very advanced configuration. They process the requests of client machines. Their role is to make management of network easy and uniform. 1) They have large storage capacity. 2) They are able to provide information to many computers simultaneously, therefore have large RAM. 3) Its processor speed is high, as it may have to execute multi-tasking too. What are clients in client-server model? Clients are the individual components which are connected in a network. They have a basic configuration. Client sends a request/query to server and server responds accordingly. Please note that the client doesn't share any of its resources. They are subordinates to servers, and their access rights are defined by servers only. They have localized databases. 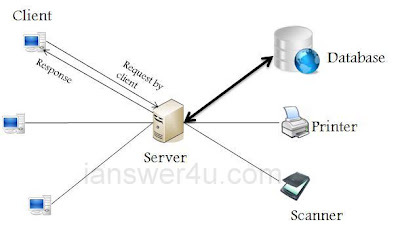 3) Network Devices :- They connect the clients and servers, and at the same time ensure proper collision free routing of information. 4) Other components like scanner,printer, etc can also be connected to network architecture. Advantages and Disadvantages of P2P network.